In a heavy based pan sweat the onions in the olive oil until they become very soft, darken in colour and almost fall apart. 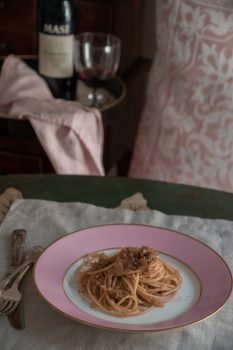 Now add the anchovies and the wine, cook gently until the wine evaporates and press the ingredients with a fork to obtain a thick paste like sauce. In the meantime cook the bigoli pasta in salted water until al dente. Reserve a small cup of cooking water (too add to the sauce if needed). Once the pasta is ready, drain it and add to the anchovy sauce along with a couple of tablespoons of the cooking water. Stir very well until all the pasta is well coated with the sauce. *I really like the cinnamon version and I strongly encourage you to add a bit of it. *You may want to add some seasoning like salt and pepper, but I would be very careful with the quantities. Serve while still warm and I hope you like it as much as we do.